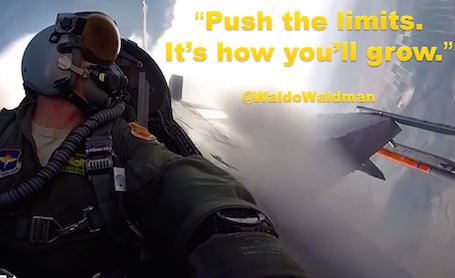 In the world of the fighter pilot, we have a saying – you fight like you train. When the pressure is intense and the missiles are real, you better be able to perform and perform well. If not, you’re dead. There’s no second place. If you can’t find a way to win, the job isn’t for you. I get that for most of you, performance on the job isn’t life or death. But it is the life and death of the sale, your career, and perhaps your child’s education. Each day, your future is on the line. How you perform counts! You train intensely. You master the fundamentals and take ownership for your success. You read the books, attend the seminars, and become an expert in sales, communication, technology, and performing under pressure. You have teammates (wingmen) that enforce standards, emulate excellence, and hold you accountable. Winners fight like they train. They don’t train to survive, they train to win! And they take it seriously. Business is ultimately about performance, not philosophy. Regardless of your position or title, you need to constantly be thinking about how you can improve your performance and ultimately win the business missions you fly. On the flight path for success, you must improve every day. Innovation comes from the Inside out. How serious are you about your training: in sales, customer service, communication, technical skills, marketing, health and fitness, etc.? What books are you reading and what seminars are you attending? Who are you training, coaching, or mentoring? At end of the day, it involves a lot of sweat and sacrifice. But you have to want to get better. Winners love the “battle.” You should too. It’s about growth. And guess what? Growth takes work. This mindset and culture of performance is not only in the DNA of every fighter pilot; it’s in the DNA of every fighter squadron. So find out what you need to do (today) to sharpen your skills and adapt to the ever-changing competitive world you live in. Stretch. Grow. Get uncomfortable! Your wingmen need you. You never know the life you can impact because you’re better than you were yesterday.